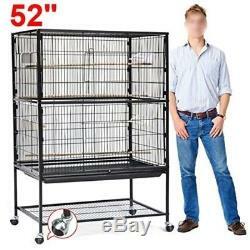 Large Play Top Bird Cage Parrot Finch Macaw Cockatoo Birdcages House 52 High. Material: made of premium iron frame, ABS tray and solid wood perch Finish: coated with spraying powder paint in silver anthracite finish Wheels: features with 4 durable swivel casters for easy mobility Carefully packaged: with 5-layer corrugated cartons for added safety 1 Slide-out floor grid for birds standing casually while cleaning cage Features with small barred spacing, allowing for birds in varied sizes Contains 2 vertical doors for birds, convenient for bird to be in or out cage Simple design, easy to assemble under the manual enclosed Specifications: Material: Iron ABS Solid Wood Dimension: 31.1 x 20.5 x 51.2'' (LxWxH) Cage Size: 31.1 x 20.5 x 37.8'' (WxDxH) Door Size: 10.6 x 7.5'' (LxW) Bar Spacing: 0.7'' Wire Dia. 0.8'' 1.6'' Tray Size: 28.7 x 18.9 x 1.2'' (LxWxH) Wheel Dia. 2'' Distance between Racks: 9.1'' Ground Clearance: 4.3'' G. 42.6 Lb Bonus: 1 Free Feeding Bowl Packing List: 1 x Large Parrot Cage 1 x Assembly Instruction. · 31.1-inch long, 20.5-inch wide, 51.2-inch high with 0.7-inch wire spacing · 2 Large feeding bowls (one for free) and 1 drinking bottle for daily needs · 1 Removable sand tray, easy to replace bird sand · Large feeding site with 3 adjustable standing timber perches · Features with a lower rack for temporary storage or display. "Length: 31.1 inch Height: 51.2 inch Width: 20.5 inch Weight: 42.6 pounds". Large Play Top Bird Cage Parrot Finch Macaw Cockatoo Birdcages House 52 High 31.1-inch long, 20.5-inch wide, 51.2-inch high with 0.7-inch wire spacing 2 Large feeding bowls (one for free) and 1 drinking bottle for daily needs 1 Removable sand tray, easy to replace bird sand Large feeding site with 3 adjustable standing timber perches Features with a lower rack for temporary storage or display go2buy Large Play Top Bird Cage Parttot Finch Macaw Cockatoo Birdcages Material: made of premium iron frame, ABS tray and solid wood perchFinish: coated with spraying powder paint in silver anthracite finishWheels: features with 4 durable swivel casters for easy mobilityCarefully packaged: with 5-layer corrugated cartons for added safety1 Slide-out floor grid for birds sta. Our stock all ships from our US-based warehouses. We stand behind our products. We do our best to process as quickly as possible. Most orders are in transit for two days but some may take longer. The item "Large Play Top Bird Cage Parrot Finch Macaw Cockatoo Birdcages House 52 High" is in sale since Saturday, August 12, 2017. This item is in the category "Pet Supplies\Bird Supplies\Cages". The seller is "exclusivedeals*co" and is located in US. This item can be shipped worldwide.